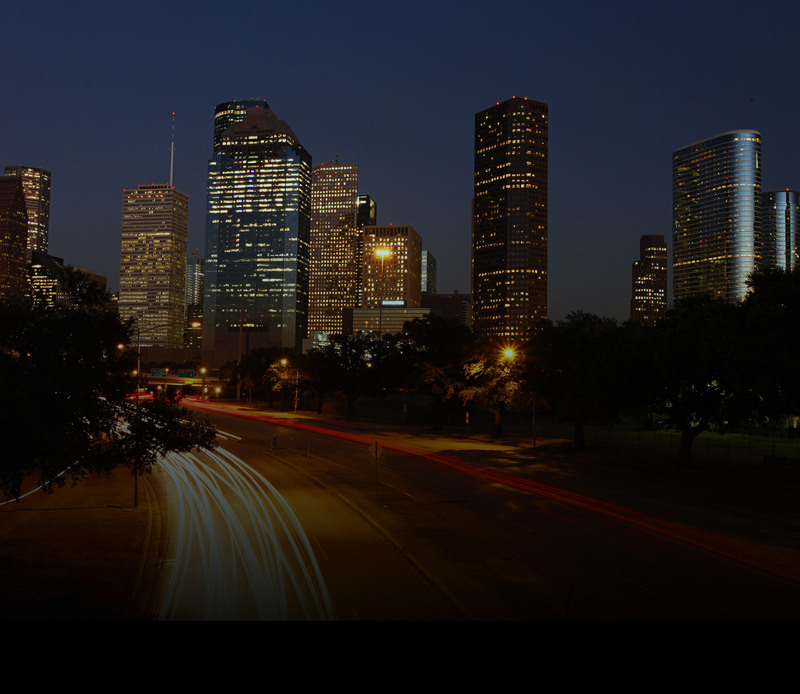 FTS is your full-service transportation company serving Houston and the surrounding areas for over 30 years. In addition to traditional airport transfers, we provide a variety of services for individuals, groups, and business in Houston, and throughout the areas around. FTS is a proud member of the National Limousine Association (NLA). We are also members of the Houston Area Limousine and Charter Association (HALCA), and the Lake Houston Area Chamber of Commerce. Over the past 30 years, FTS has earned the status as one of the top, Full Service Limousine Services in Texas. We go the extra mile to provide outstanding service to our clients. With us, impossible is almost never an option, and our clients know it. Our commitment to exceptional service translates to customer satisfaction, superb fleet, unparalleled safety, and client schedules that are always on point. Your appointed private driver will make sure every second of your trip is pleasing, and just the way you’d envisioned it. You’ll love our expertise and efficiency along with all the limo benefits we offer. To our team, nothing matters more than your absolute satisfaction with our limo and black car service. With FTS, you are in the right hands. Don’t listen to anyone’s reviews, trust your gut: Book a ride with FTS Houston to experience yourself what true limo luxury actually feels like. Every transfer with FTS is the type of a deluxe treat you deserve. We are here to guarantee comfort, efficiency, and safety no matter where you need to go. The corporate world is where talent, persistence, hard work and dedication live, and being one of the successful ones, you do understand the importance of structure, efficiency and the right-now mindset. Well, so do we. Don’t ever again let your partners wait because someone stole your parking spot. Don’t let your meetings cancel because of lousy traffic, or your investors leave because you couldn’t make it on time. Book a corporate ride with FTS and see what prompt, professional and always-on-time really means. What you want is what you get – at least when you book with FTS. Treat yourself right, and book a limousine service that will make every concert, birthday, night on the town and every other venture even more thrilling than they already are. FTS is here to make your days phenomenal. When travel plans come together and your luggage is packed, the only thing left to do is make it all sparkle with a convenient, yet very comfortable, limo ride to the airport. FTS is known for treating their customers with grace and making sure they don’t lack for anything. Try us, you won’t regret it. You don’t have to book a private plane to experience fashionable airport service. Check out our rides to the airport and you’ll experience what we’re talking about! For over 30 years, FTS have been providing prompt and professional transportation to the Houston George Bush Intercontinental Airport (IAH) and William P. Hobby (HOU) airports. We also service all private jet facilities. Whether you travel once a week or once a year, we guarantee prompt, courteous, and professional service on every single trip. The former workhorse of our sedan airport transfer fleet was the Lincoln Town Car. Since it was discontinued in 2011, we replaced this iconic vehicle with the best Luxury Sedans on the Market. Our Current Fleet consists of the Cadillac XTS and Lincoln Continental. FTS sedans seat 2-3 passengers comfortably, along with reasonable luggage. For larger family trips, our Chevrolet Suburban SUVs are the perfect solution for overenthusiastic packers! Our SUVs can comfortably fit up to 5 to 6 passengers and have plenty of room for luggage. For Larger groups please inquire about our Mercedes Sprinter Vans up to our 44 passenger buses, and everything in between. Leave your potential investors, clients and interested parties speechless: book a ride with FTS, the best corporate shuttle rental in town. Your business deals matter to you, and helping you make a good impression matters to us. FTS is all about team spirit: you can count on the best black car rental in Houston, and a team that works to your advantage. With us, you’ll never be embarrassed or late. Do business the right way: take a ride with us for your next corporate event, and show everyone what an outstanding business presentation looks like! Your corporate car is in our garage and it looks a lot like a lavish shuttle experience you’ll care to repeat. FTS also specializes in a variety of corporate services. 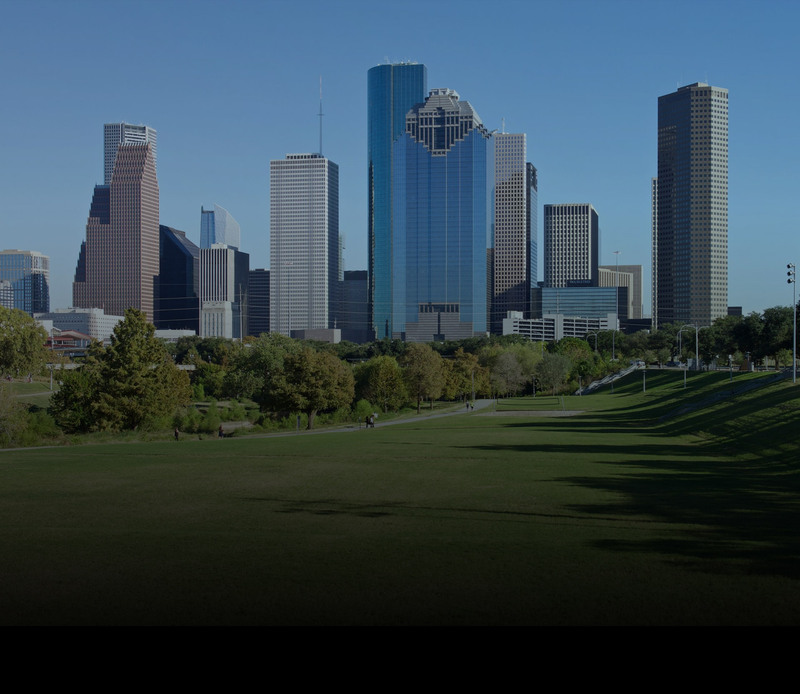 We were the first company in Houston to establish dedicated shuttle runs for crew changes with many of the prominent oil and gas companies throughout Houston and surrounding areas. FTS can also provide convenient private shuttle services for large corporate seminars, training events, and trade shows. Many of our clients love the convenience, savings, and safety of dedicated service to, and from, their corporate destinations. These days, more and more people are choosing heli transfers, and we understand the appeal. Helicopter transfers are particularly convenient for short and island destinations, transfers from the airport directly to a hotel, and smaller groups who love experiencing the natural beauty of their destination from the air. FTS doesn’t offer helicopter transports, but we do provide the best car service to take you to your heliport. Our team has been safely carrying crews to heliports across Houston and the area for almost 10 years now. Our dedicated shuttle vans, efficiently transport your teams to meet their awaiting flights. Operating 24 hours a day our reliable service keeps your rigs and other capital assets at their peak production. FTS arranged its services so they are the most convenient option for our travelers. We’re at your door whenever agreed, then we pick up the rest of your party. The next stop is Heliport, with enough time left for you to freshen up, compose and board. Since helicopters have limited storage place, consider the luggage limitations when booking your FTS limo to a Heliport. As far as we’re concerned, there’s enough space for everything you need to be stored in our car during transfer. Still, we wouldn’t want to see you frustrated when you board the Heli and have to send half of your luggage home. However, even if you do – FTS will have our chauffeur arrange your luggage transfer back home. In such case, you pay an additional amount to cover the return fees. Where do you go when you need extravagant, fancy, ornate, stylish, and/or elegant? To FTS, no doubt. Around for over a decade, we’ve become the go-to limo company for our patrons who enjoy everything from airport services and corporate transfers to wedding limousines, nights on the town and other luxury transportations with us. If you want the same thrill, you know where to find us. Long gone are days when rich spelled expensive; FTS has designed offers perfect to show off and very friendly for your budget. No matter the type of car service you are looking to book, you’ll get the absolute comfort and hospitality from our FTS family. Need a wedding limo service? Done! Looking to have a fantastic time in town without compromising your safety? Sure! After all, no one wants you to drink and drive! Want to add a little luxury to your corporate transportation and wow the clients? Say no more! FTS will make it happen, and it’ll make it happen quick. All the services we offer come as a package deal with fantastic customer service, professionally trained chauffeurs and the type of enjoyment you’ll talk about for days. 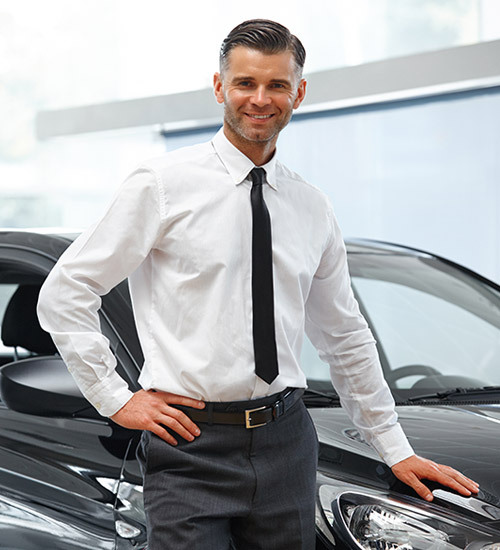 Isn’t it comforting to know that the best black car service in Houston is just a call away? It sure is! FTS doesn’t stop at perfect: we always push the envelope to ensure your absolute satisfaction with the limo service you opt for. To make this relationship work for the best, always call to reserve in advance, so there are no overbooked schedules or missed opportunities. Your times and bookings are our priority. Don’t compromise your cheering enthusiasm for a ride that may go rogue. Instead, book with FTS—we can drive you directly to the entrance of the Toyota Center, Minute Maid Park, or NRG Stadium. Next time there’s a game in town, you know who’ll be taking you: FTS is your go-to limo for sporting events, anything from baseball and football, to basketball and sports alike. Rockets or Texans, Astros or Dynamo—they are all in it together to make the (global) sports arena a spectacular thrill. There’s rarely anything as pleasurable as watching and listening to your favorite performers live, is there? We get it! Being huge concert-goers ourselves, we’ve put together a fantastic Concert Limo Service that’s always ready to take you to your favorite music event. Even if your heart is in a music festival, a public musical gathering or an unconventional gig, we’re still open for your bookings. Whether you are going to a sporting or a music event—book your ride in advance so we can prepare you the best vehicle we have. Grab your friends, give us a call, and enjoy being dropped off to your destination in style. If your next getaway has more to do with water than land, FTS will take care of your transport. What better way to start your luxurious getaway than arrive at the port in a limo? Whether you are flying in to catch your cruise ship or you live close by the port, we are your ride to the Port of Galveston. Like everyday stress isn’t enough! Why would you bother yourself with on-the-road banalities before your day on the water, right? Take the stress out of your transportation arrangement, and start enjoying your getaway the moment you say “yes” to your chosen FTS car. When there’s a group of you booking a ride to have a fabulous time, our SUV is the perfect solution for over-zealous packers! Our SUVs can comfortably fit up to 5 passengers and have plenty of room for luggage. When you and your partner are taking a vacay, an absolutely gorgeous FTS sedan will do. In case you are organizing a group outing, there is a range of vehicles to accommodate your request – from the 12 Passenger Sprinter Van to our luxurious buses. Either way, with FTS – you always win. We’re waiting for your call. You deserve to have a good time, so leave the headaches of traffic and parking to us and start the fun! Go on and schedule your transportation today, our team will handle the crazy Texas roads on your behalf. FTS Door-to-Door service is available for all events, no matter how fancy or casual they are. Whether you’re headed to a ball game, attending the Rodeo, or planning to enjoy a sold-out concert, our team can pick you up and drop you off. Have that extra beer, enjoy yourself without the burden of heavy conscience, FTS is driving you home! No matter where in Houston and the surrounding areas you want to end up at, FTS is the way to go. Whether you’re traveling with a small group, a large party of friends or by yourself, you have nothing to worry about—we’ll get you where you want to be! With a simple booking process and fantastic prices, you really have nothing to fear when booking with FTS. Wherever in Texas you want to go, we’re the people you want behind the wheel. When you choose us as your mean of transport—you’ll never lack for anything on the way to your destination! Everything you need in a transportation service, you’ve got with FTS Houston. We offer shuttle services for all special events and promise to deliver a limo experience of a lifetime. Hop in, let’s have a good time! May it be prom, wedding, bachelor or bachelorette party, anniversary, engagement party or any other happening—any special occasion of yours is an equally important day for us. Anytime your special event calls for that special glamorous touch, FTS team is there to assist you with our smooth rides, pleasant attitude and expertise in all things travel! From a 2-person sedan to a 40 passenger bus, our team can accommodate your needs. We’ve just added our 3rd bus to the fleet, and you’ll absolutely love the type of luxury rides that come with these wheels! Your friends, family, co-workers and partners will love it too! Leave the Stress Behind, FTS Comes to the Rescue! Big events usually come with complications, so let us take the transportation-related issues from your plate. Our mission is accomplished only once we see the worry-free smiles on our passengers’ faces. For people who know what they deserve, FTS made sure we provide an enticing selection of vehicles to accommodate to your transportation needs. The finest luxury sedans and luxury SUVs, executive vans, limo buses, and minibuses along with a line of other options will leave you with a memorable experience on your hands. When you book a luxurious ride with us, you instantly know this is what you’ve been missing all along. At FTS, we make sure you get what you are after. Do you want the comfort of a limousine but the privacy of your own personal car? Then you’ll find the perfect solution to all your transportation requirements in any of the deluxe sedans our company has to offer. Cadillac XTS can fit up to 3 people and their luggage, and with our FTS expert driver behind the wheel, you’ll get where you need to go in no time. In case you want something that represents the essence of deluxe capability, our Lincoln Continental is the transfer option you’ve been looking for. This luxury sedan can seat up to 3 passengers (with reasonable luggage) and once you’re in you’ll get to enjoy all-leather interior, heated rear seats, as well as independent rear climate control. When you’re on your way to your the airport, business meeting, or any other occasion or location with a bigger group, it seems that there is never enough leg room, right? Well, not with our Chevy Suburban SUV! Don’t worry about the luggage, this vehicle has plenty of space, for both passengers and cargo. Sit back and enjoy the ride. When you say “I want a lavish sedan limo rental”, chances are, you’re picturing a black Mercedes-Benz S550, right? FTS Houston has got you covered in that regard as well! Next time when you want to enjoy an upscale ride, you simply can’t go wrong if you choose this vehicle. So, let our driver take the wheel while you relax in opulent surroundings this black car offers. Anytime you have up to 12 guests, you can count on this magnificent Mercedes Benz Sprinter Executive to be the solution for Corporate Executives or group airport transportation. With separate, extremely spacious luggage/cargo space, leather seats, many additional features which are both luxurious and convenient, you’ll wish your ride lasted longer, even when you do reach your desired location. This amazing Sprinter has both Corporate and Leisure applications, for all your needs! The best choice when it comes to both business and pleasure. These Mercedes Benz Sprinter Limousines are slowly replacing the traditional limousine. The days of sliding in and out, feeling claustrophobic, having purses and flowers on your lap, and unable to stand and move around are over. All the modern entertainment options are up to date and awaiting your enjoyment. 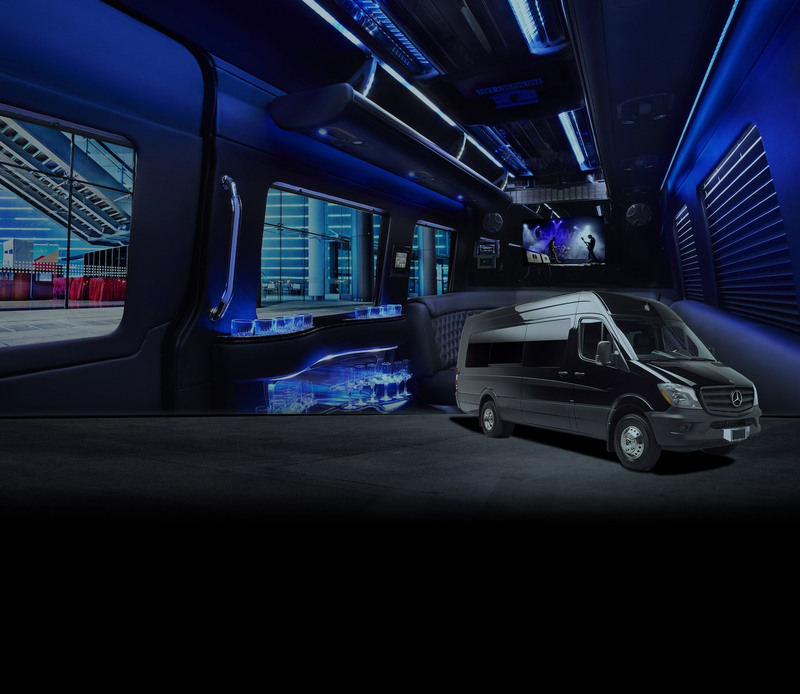 Our Sprinter Limousines have state-of-the-art Music and Smart Television Systems with all connectivity options available as of 2019. USB, Bluetooth, Screen Sharing, HDMI, XM, CD, DVD, Pandora, and of course AM/FM. FTS Houston has an upscale Mercedes Sprinter Limousine ready to go, and its performance will impress your business partners and family members equally. This vehicle is designed to keep you and your group happy, comfy and dazzled all the way to your destination, no matter how far away that is. When your transportation needs are in question, FTS Houston’s very own, sparkly clean Cadillac Escalade ESV is parked and ready to take you wherever you please. Prepare yourself for the uniquely peaceful but still glorious SUV adventure, when you choose this excellent vehicle as your means of transport. Get the ride of your dreams today! With stretch limousines, it’s really not just about the destination, is it? There’s something about the luxury of it all, paired with a safe, punctual and hassle-free arrival to your end-location. Lincoln MKT Stretch Limo will treat all of our clients to a smooth and luxurious experience, no matter where you’re headed. Perfect for any occasion that requires that little addition of glitz and glamour, this ride comes with an unprecedented amount of sophistication. That said, it’s no surprise that our Escalade Stretch Limo is the top choice of all passengers that demand elegance and prestige when it comes to their luxury rentals. Don’t settle for second-rate when the best is right at hand! Limousines are a thing of beauty, but when you have over 20 people in your party, a minibus is the way to go! They’re gorgeous in their own way and perfect for team buildings, and sports events, and a number of events alike. They provide a sense of absolute opulence, comfort, and enjoyment. When you opt for our fantastic minibus, nobody in your large group will feel left out. You surely didn’t doubt our capacity to handle groups that count more than 30 people, did you? This luxurious bus, which can seat up to 44 people, is parked in the FTS Houston garage, waiting for your next event (no matter how big or small), ready to take your people to the next family gathering, conference, wedding or any other occasion. Give comfort and convenience a chance! Limousines are a thing of beauty, but when you have over 20 people in your party, a minibus is the way to go! They’re gorgeous in their own way and perfect for team buildings and sports events, or any kind of group event you can think of! Our party buses are equipped with top-of-the-line entertainment options, from CD, DVD, and AM/FM systems, to Bluetooth and Screen Sharing. We provide a sense of absolute opulence, comfort, and enjoyment. When you opt for our fantastic party bus, nobody in your large group will feel left out. I always needed a limo service that won’t embarrass me in front of my clients, and I finally found you! Now, I’ve got a reliable team I can count on to be on time, polite, with vehicles I’ve only seen in movies. Oh, and one that’s pretty budget-friendly. Thank you for helping me get my client interactions to a new level! You don’t expect a limo service to be as good live as it advertises to be, but you guys are killing it! I’ve never been as pampered as I have been with you, every time I book. I honestly feel like a rock star every time I have to get to the airport and back. You’ve got my vote! I said “I do” a few days ago, and your wedding limo service made our ceremony even more incredible than I could ever dream possible! Thank you so, so, so much! My maids of honor and hubby loved the limo, my parents were overwhelmed and I was over the moon! Ron was the best driver, and the limo was spectacular. You are amazing! I am a pretty cheap guy, but I’ll always choose to spend money on a limo service like yours! You got me stunned with how professional, on point and fair you are, and I’ll recommend your limo services to everyone. We hired you for our engagement party, and for airport transfers, too. Just perfect. Thank you! We are here to meet all of your transportation needs. Feel free to give us a call or fill out the contact form. Copyright © 2019. FTS Houston . All rights reserved.